There is something about coffee that people love the most and through the years, innovative coffee makers are designed to fit every lifestyle. If you want your coffee or any hot beverage for that matter anytime you want without having the hassle of refilling water into your machine, then the coffee maker with water line is best for you. Here are the two coffee makers you can choose from, with an added feature of a water line. 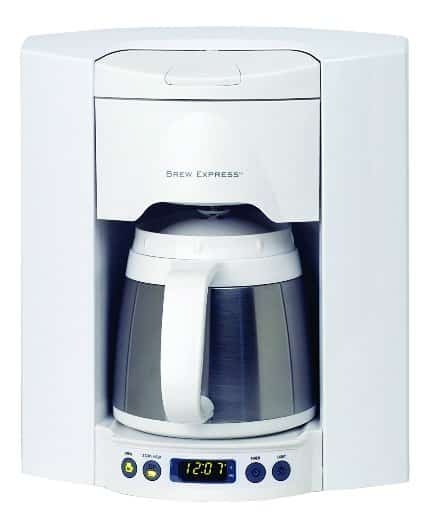 Brew Express BEC-110BS 10-Cup Countertop Coffee System, Stainless/BlackThe BEC-110BS 10-Cup Countertop Coffee System is another incredible product form Brew Express. It comes with either stainless or black that will surely fit your style. This coffee system is not only proven to give high performance, but it makes your life easier. No more messy filling of water, instead you can connect this coffee maker directly to your water source and it auto fills. The 10 cup thermal carafe will give you and your love ones coffee or hot beverages anytime you want. You can even adjust the volume of your coffee drink with the adjustable cup selector. 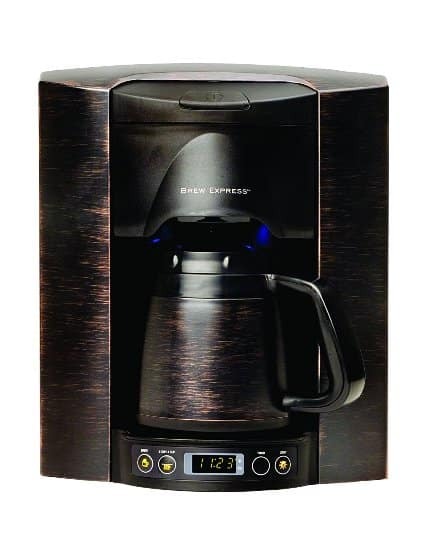 You really have to experience great brewing with this coffee maker without having to spill a drop of water. 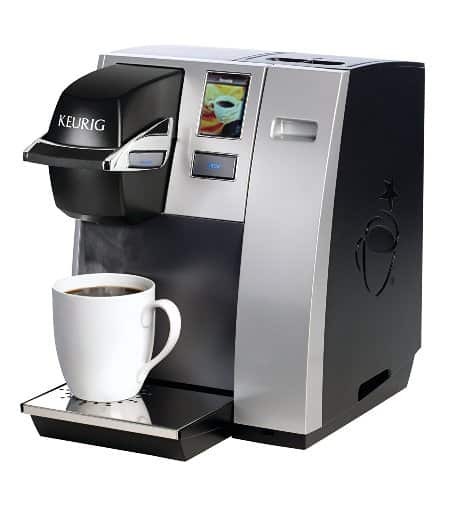 Keurig B150 Houshold / Commercial Brewing System: Coffee , Tea, Hot CocoaAre you up to for a cup of coffee? How about a tea or maybe a mug of cocoa? 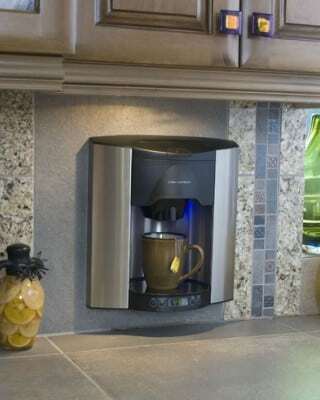 Whatever hot beverage you want the Keurig B150 Household / Commercial Brewing System can provide you all that and more. It’s quiet brew technology provides making coffee more pleasantly than usual. You can even choose the amount of hot beverage you want by the 5 cup sizes feature. 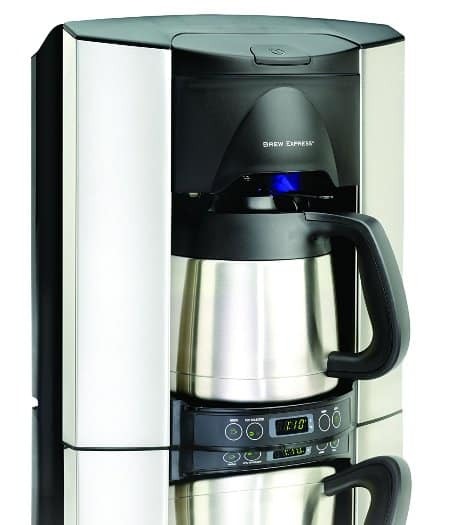 If you want a coffee maker that doesn’t use up much electricity, then this is perfect for you. The energy saving mode automatically turns on and off. What’s more, great about this machine? It has a direct water line plumbing compatible with most optional accessory. You really have to check this out. Here are a few other products and water line accessories to look at. In our Automatic Drip Coffee machine vs. Coffee Percolator article, we discussed the brewing process of both mechanisms. In the Coffee Percolator, steam is generated by a body of water. Water evaporates and condensates to form drops of liquid which fall into the beans of coffee. The droplets then proceed to fall back into the body of water and the cycle repeats itself. The automatic drip coffee on the other hand automates this process. Here, water is placed in a reservoir much like in the percolator. It is then brought to a near boil and an aluminium tube attached to the heating element brings the water from the reservoir to where the coffee beans are placed. The end of the tube is a showerhead from which the water is then sprayed onto the beans. The water passes through the beans and come out as coffee. Taste-wise, Coffee Percolator brews have a stronger and more robust flavor compared to Automatic Drip Coffee brews. This is mainly because of the characteristics of the percolator method. Firstly, the percolator keeps the coffee beans in practically the same enclosed space. This enclosed space is subject to heat and as a result, the coffee beans are being roasted in what is essentially a pressure cooker. Continual roasting is not ideal as this turns the coffee bean’s taste into something more bitter. Unlike the percolator, coffee beans are not subject to heat in the Automatic Drip. In fact, neither water nor coffee beans are subjected to heat and pressure in the Automatic Drip. It is only the aluminium tubing that turns the water from cold to hot. Coffee beans are preserved and spared continual roasting. Secondly, the percolator over extracts the flavor from the beans by repeatedly sprinkling water over them. Automatic Drip only passes water once through the beans. This keeps the beans from being over extracted and a smoother taste is then yielded. Though the Automatic Drip Coffeemaker does have the word “automatic” in it, the process still involves a little manual labor. Users still have to pour water into the holding container of the pot. Though this may seem like a menial act to consider, coffee drinkers now demand the most from their coffee machines. As a workaround, manufacturers now produce coffeemakers with water lines attachments available. This nifty add-on makes it all the more convenient to use what is already a very convenient way to brew coffee. Commercial coffee machines are all attached with a water line extension. Go to your nearest Starbucks and you’ll notice that the baristas don’t seem to be running around with pitchers full of water to satiate your coffee craving. Instead, these baristas look cool by simply taking your order, pulling a lever here and there, dressing your coffee according to your specifications and serving it to you. The water line extension is a very efficient way of running business. Of course, coffee shops do not necessarily have to hoard all the fun. Many coffee aficionados out there have done a little plumbing to supply their coffee machines with its own water line extension. Water line extensions come in two ways. One can have tubing directly connected to the waterline of your house. If this option is not possible, one can purchase a water line for the coffeemaker model and attach it to a 5 gallon water jug, the same ones used in water coolers. Some users also prefer to install a water filter to ensure that their coffee is clean and of good quality. According to coffee experts, it is recommended that the water used for coffee contain a total hardness of 7–12°EH, a carbonate hardness of 3–4°EH and a pH value of 6.5–7.5. Obviously, the main benefit of having a water line extension is the convenience it provides. One does not have to keep pouring water into the pot. Instead, coffee makers with line extensions automatically supply the water according to the discretion of the user. 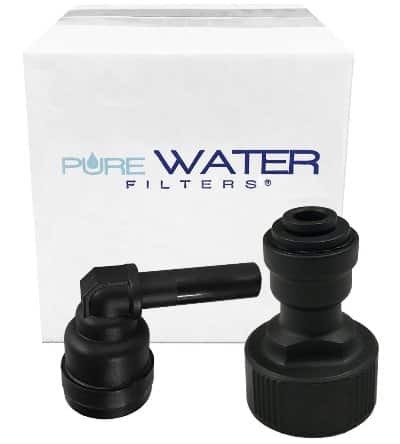 This very convenient feature is a result of clever engineering involving a tube, pressure regulator, shut-off valve and if preferred, a water filtration system. Another pro of having a water line extension is that it ensures a consistent, clean quality of your coffee. As mentioned, water line extensions can be modified to accommodate in-line water filtration systems and one can even connect the coffeemaker to a mineral water source. Of course, users can also pour filtered water manually in their machines but this option, coupled with the automated system, makes the process of brewing coffee a more wonderful experience. Most coffeemakers on the market actually come with an outlet to attach the water supply with. Notable manufacturers such as Keurig even supply their models with water line extension kits to facilitate the attachment process. It then makes it a no-brainer to attach one’s coffeemaker with a water line extension given how manufacturers have made it easier than ever to have one. We’ve discussed the pros of a water line extension above but we have not gone in full detail what it takes to have one, which is precisely why it is a con as well. The process of attaching a water line may take some advanced know how of plumbing for it to work properly. It is recommended that one either hire a plumber to install it for you or do some research beforehand if you plan to do it yourself. 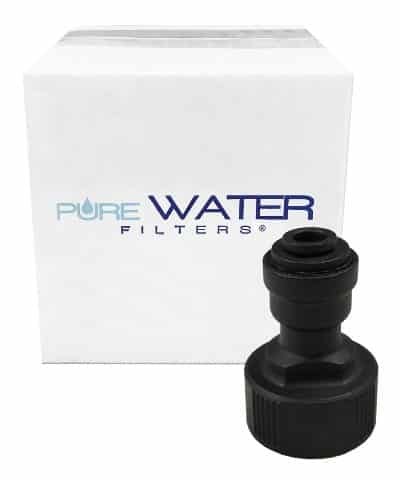 Another con having a water line extension is that if the installation is done incorrectly, this can do some serious damage to your water filter and coffeemaker. Risks such as the tubing detaching, incorrectly installed pressure regulator causing too much water to be flushed per use and perhaps even flooding the coffee machine as well as the valve not pumping water at all are legitimate issues. Lastly, one must also do careful research about the water line connection setup appropriate for the model since setups are not modular, meaning there are specific tubes, pumps and valves for each coffeemaker.